Saturn's north polar vortex and surrounding jet-stream hexagon, as seen by NASA's Cassini spacecraft on April 25, 2017. Scientists used a big rotating pot to simulate the atmosphere of Saturn, and they may have figured out how the gas giant's massive polar storms take shape. With winds reaching staggering speeds of up to 1,100 mph (1,800 km/h) — in our solar system, only Neptune can be windier — and storms the size of Earth, Saturn's atmosphere has fascinated researchers ever since they got the first good looks at it via observations by NASA's twin Voyager spacecraft in the early 1980s. "Very little is known about convection and vortices in the deep atmospheres of gas giants Saturn and Jupiter," said study leader Yakov Afanasyev, a professor of experimental oceanic and atmospheric fluid dynamics and numerical modeling of geophysical flows at Memorial University of Newfoundland, in Canada. "Our current understanding is based on theories and quite idealized computer simulations, which do not yet approach the parameters of the real planetary atmospheres." The team's 43-inch-wide (110 centimeters) pot, which holds several hundred liters of water, was heated from below to simulate convective processes taking place in Saturn's air. Water warmed by the heater rose, whereas surface water, which was cooled by evaporation, sank toward the bottom. "We were trying to make water more turbulent by heating it and see how it behaves in the rotating tank, which simulates the rotation of the planet," Afanasyev said. "No experiment, or computer model for that matter, can model an ocean or atmosphere of a planet in all their complexity. What we can do is to model the essential dynamics." Afanasyev said team members were not entirely sure what they would see when they started the experiment. "The focus of our study has changed when we observed multiple small, tornado-like vortices in our tank," he said. "The vortices resemble those observed by spacecraft in the atmosphere of Saturn." Afanasyev and his team were particularly interested in what drives the creation of powerful polar vortices located at the center of persistent hexagonal storms known from images taken by NASA's Cassini spacecraft. 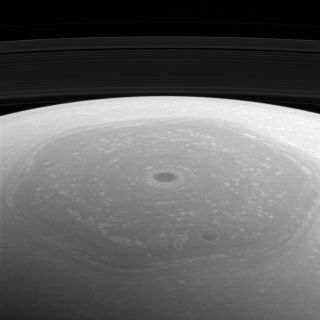 Previous research showed that these hexagonal storms are caused by Saturn's jet stream, Afanasyev said. The central hurricane-like vortices, however, have been puzzling; researchers aren't sure why they occur on the poles. But the pot experiment suggested that giant polar hurricanes might be a result of multiple smaller vortices merging in the polar region. "A strong vortex is created at the pole as a result of mergers of small-scale cyclones," the researchers wrote in the paper. "The polar vortex penetrates all the way to the bottom and alters the anti-cyclonic circulation there." Previous research suggested that smaller cyclones can arise in other areas of the planet and be subsequently driven toward the poles by the combination of its rotation and gravity. "Our experiments gave us this idea, but we were not able to see the polar cyclones in our tank," Afanasyev said. "It is because we can only model an upside-down atmosphere in our experiment. The vortex would be at the bottom of the tank rather than at the surface." The researchers therefore had to turn the "atmosphere in a pot" upside down digitally. The combination of the two approaches — the experimental tank and computer modeling — is what offers the best results, because each approach alone has serious limitations for simulating the behavior of planetary atmospheres, Afanasyev said.